This is an excellent abstraction. You get extra points for the mathematical reference in the title. Was it the configuration of the creek bed that caused the water to flow so geometrically? Thanks, Steve. I thought you’d enjoy the title. The cause of the intersecting currents was a point of land no more than two feet long — really just a triangular-shaped gravel bank with some ferns on it — that extended into the water. It lay just outside the frame in the upper right. The main part of the stream was flowing from right to left: so shallow that the variously-sized rocks created those horizontal striations. But water also was coming around the upper part of the gravel bank, then flowing across the main part of the stream from the top of the frame to the bottom. Where the two flows intersected, the squares and rectangles developed. Very cool!! Amber and toffee, and I love both of those. Amber and toffee, indeed. By sheer luck, I found this little spot at the bottom of a canyon just about an hour before sunset. While it was shadowed by the cliffs, the sun was in just the right place to add the golden light that gave the water this glorious color. Thanks, Gary. The simplicity of the combination of lines and color really pleased me. A very interesting image!! Wonderful liquid textures….really pops. Even though we may appreciate seeing interesting patterns and surfaces day to day, I think you see even more when you have a camera in your hand. You are always on the look out for pretty textures, whether water, flower petals or birds’ wings…..it is as if your senses are amped up some. I agree we often see more with the camera in hand, but I’m not sure it’s the camera itself that makes the difference. It seems that slowing down and looking more carefully, more inquisitively, are even more critical. That’s why I make it a point to go out now and then without the camera. Those times are just as useful for learning how to slow down and interact with the world on its terms. I know there are people who always carry a camera, or at least their phones, but it seems to me that the presence of a camera changes our relationship to the world. That’s not necessarily bad, but it’s something that has to be accounted for — or so it seems. In any event, it was a great delight to be in an area with fresh, clear water. Finding a creek doing such interesting things was even better. And to think — I always thought liquid amber was only a tree. Brings back memories of the patterns in the flow during our recent flooding… Beautiful capture. Water’s endlessly fascinating to me. Whether it’s filled with swirls and eddies, like the flood waters, or simply burbles along like this tiny creek, it’s much like a fire: I could watch it for hours. I’m glad you like the image. I thought it was unusual, and worth sharing. The explanation’s really simple — I detailed it in my response to Steve at the top of the comment thread. Enlarge the scale substantially, and you’d have something akin to confused seas offshore. I must say, I’ve never seen such squared-off waves (or wavelets) without the camera to help things along. It’s another great example of how a camera can help us to see the world in a different way. Great capture, Linda! Looks almost like a waffle with syrup flowing over it! What a great image, Debbie. Any photo that can be interpreted as amber, toffee, and a syrup-drenched waffle has something going for it. I’ve got some maple syrup, but alas — no waffle. Maybe I’ll find one this weekend, and think of you while I eat it! I thought of amber too, Gerard. I was lucky enough to find the little stream late in the day, when the light had softened and turned golden. Consequently, the water did, too, even though it was in the shadow of some cliffs. I certainly didn’t plan it that way, but I was grateful that I happened to be in the proverbial right place at the right time. What an interesting image. I’ve never seen cross-currents like that except at the beach when the tide has turned. That’s a good example of the same phenomenon. We don’t have the sort of tides here that create cross-currents, but farther down the coast I think they might set up where the rivers and bayous cross the intracoastal waterway. Here on Galveston Bay, the tidal range is only one to two feet, and it’s more an up and down motion than in and out: hence, less visible current. WOW! That one went straight into the computer desktop file. I’m going to enjoy looking at that when its turn comes. Again, if you ever start an Etsy store for your prints, that one! Isn’t it cool? Once I saw the detail on the computer, everything about it appealed to me: color, lines, the unexpected shapes. I’m honored that it’s joined your rotation. You mean like the back of this big boy I met down at the slough last weekend? Maybe I should have looked a little more closely under the surface of that water — who knows what lurks in those placid hill country streams? Pre-coffee, I read the title, but when I looked at the photo, I thought: ‘Wow, what a shot of hone!’ That said, it’s a beautiful shot! I always correct typos in comments when I come across them, but you stumped me with “hone,” Tina. At first I thought you meant “bone.” Then, I thought maybe you meant “home,” since this was in your part of the state. Then, I decided to check the dictionary for the meaning of “hone,” since I know it only as a verb. When I read that “hone” as a noun means “whetstone,” I had to laugh — since these are, in fact, wet stones! In any event, I’m glad you enjoyed the photo. Every now and then I’m surprised when I upload a photo to the computer, and this was one of those times. This is a fabulous photo! It looks like chocolate caramels! What a delightful vision, Jeanie. You’re exactly right: chocolate caramels fit right in with the other sweet interpretations — toffees and syrup-drenched waffles. I so enjoy watching the things that water can do as it flows, but I’ve never seen anything quite like this. That’s beautiful, Linda… looks almost like sugar syrup ready to make toffee! Doesn’t it, though? There’s a town in Texas called Sweetwater. This seems to be striking people as a very sweet water, indeed. The color is very pleasing. There seems to be a translucency of light also, glowing from underneath. I think that might be partly due to the shallowness of the little creek, which couldn’t have been much more than two or three inches deep at that point. I suspect that the play of light on the stones just below the surface of the water contributed to the effect. It is lovely, although I didn’t notice it at the time. When I first glanced your beautiful image I though it was some kind of reptilian skin. 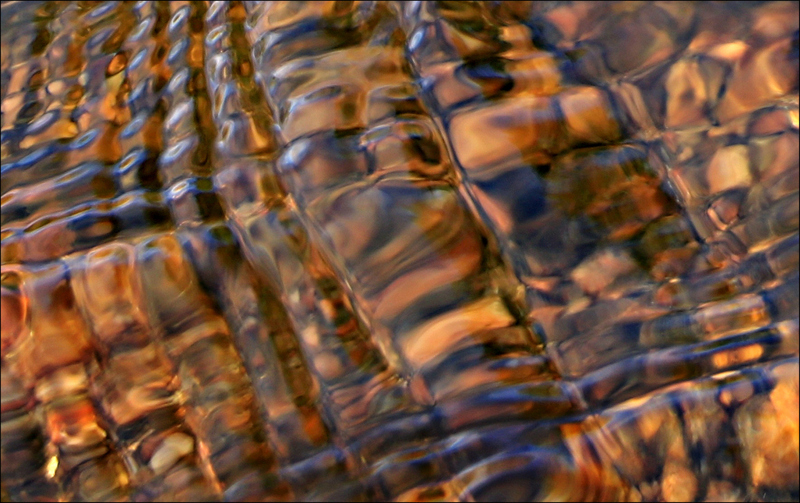 But now I realise you have captured the wonderful ripples, colours and reflections in moving water. Water moving two ways! I love this, Linda! Lovely abstract! I love the different ways people have seen this: reptilian skin, waffles, toffees and caramels, amber. The more I think about this, the more it seems that the speed of the water flow from each direction, and perhaps other factors, had to be perfectly matched for the effect to occur. In any event, it truly was a right place, right time sort of experience. I’m glad you enjoyed it, Pete. It was lovely, Dina. I’ve been to this place twice now, and have sworn both times that next time I’m going to get an earlier start, and linger longer. Unfortunately, I couldn’t linger much longer this time — it was about to get dark. I enjoy winter, but it does have its inconveniences. The color was a real treat. I suspect it’s a combination of very clear water, reddish and brown stones, later afternoon, golden light — and who knows what else? It certainly lent itself to a variety of interpretations, although I’ve had a hard time deciding whether I like the color best, or the unusual geometric shapes. All in all, it turned into a real treat of a photo. Marvelous colors and what a lucky find to photograph. I like this one very much. Isn’t the color great? I love that so many different interpretations came along: toffee, waffles, amber, etc. This is exhibit #28,305 of why it’s good to get out of the car and walk. I never would have seen this, otherwise. That is a fantastic image! it should be used in a ‘can you guess what this is?’ prompt! It looks metallic, like cubes of gold or even some amazing chocolate-caramel holiday temptation! your image here only suggests lovely colors and form – a very nice image that remains in my memory!! !